If you don’t fancy using gel liners or a liner pencil and would only want to use liquid liners, because you have seen your mommy and sisters or a friend in college do so, we are here to help you learn the same. Since you are a beginner, we would ask you to start small and then go on to much more complex ways of applying liquid liner. But just because we say start simple, it doesn’t mean it has to be boring. Let’s first learn how to apply liquid eyeliner and then go on to check out the various styles and designs to dress up our eyelids with. Here goes! It isn’t rocket science, but it does take patience the first few times to get it right. 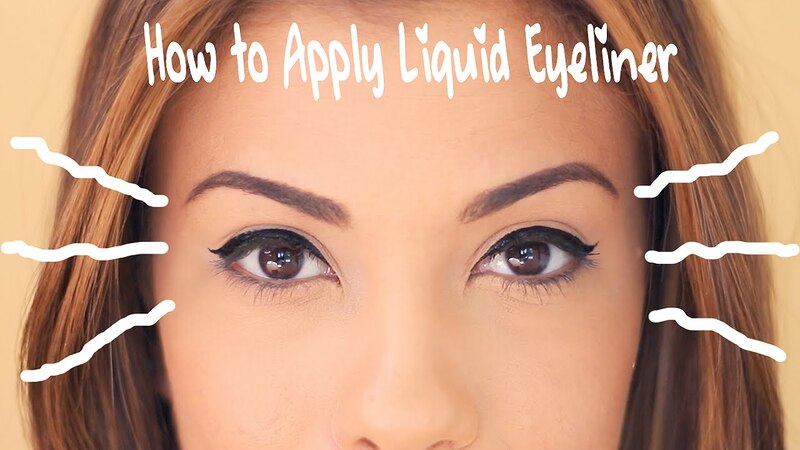 We are talking about how to get the liquid liner application for beginners to be done the right way. Read on and be well-informed of the same. Sit in front of a mirror and on a very comfortable chair, which doesn’t rock and move about. If the latter happens, chances are that your lining method would run amok and create panda eyes, which wouldn’t be needed. Now tilt your head a little behind and place the mirror at an angle, so as to look down into it. 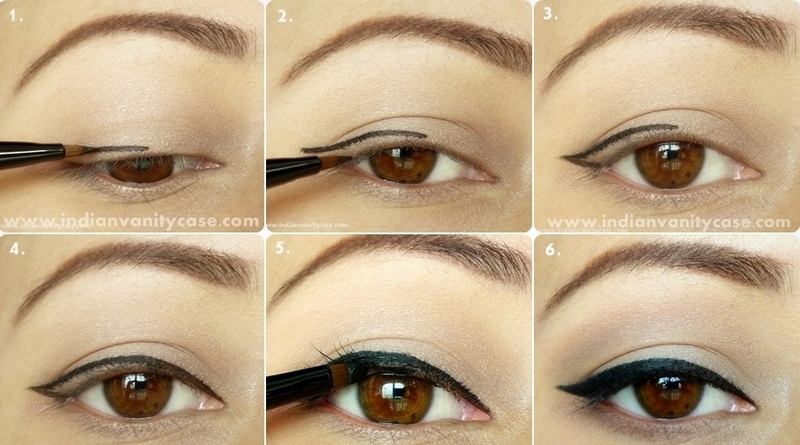 This helps you check where the tip of the liquid liner would rest on the lids. Get your hand holding the liquid liner resting on your face, and your elbow secured safe on the flat surface of the table you are seated in front of. This would help create a very smooth line. 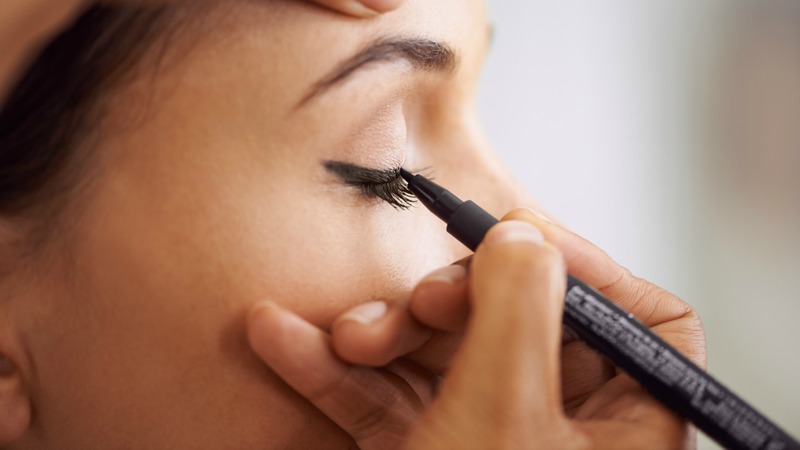 In most cases, you may need to use the other hand to gently tug at the brow area of the lid. This helps pull your eye taut, and allows for a smoother application of the liner too. Do this very gently, you don’t want to end up hurting yourself. Now start from a point of comfort; an area you think would be best to apply the first stroke of the liner from. Some choose to make a thin line from the inner to the mid and the then the outer corner; some go reverse using the mid to the outer corner and then the inner to the mid- do what is comfortable for you. Ensure that the lining is closest to your lash line, and only small strokes should be used along the lash line. Thinner the better to begin with, since you can go from to thick and not reverse. This helps with perfect application too. To make the line go from thin to thick, the application strokes should be heavier than what you did for the thin lines. Stop and check in the mirror for any gaps between the lash line and the liner, or any gaps on the liner too. 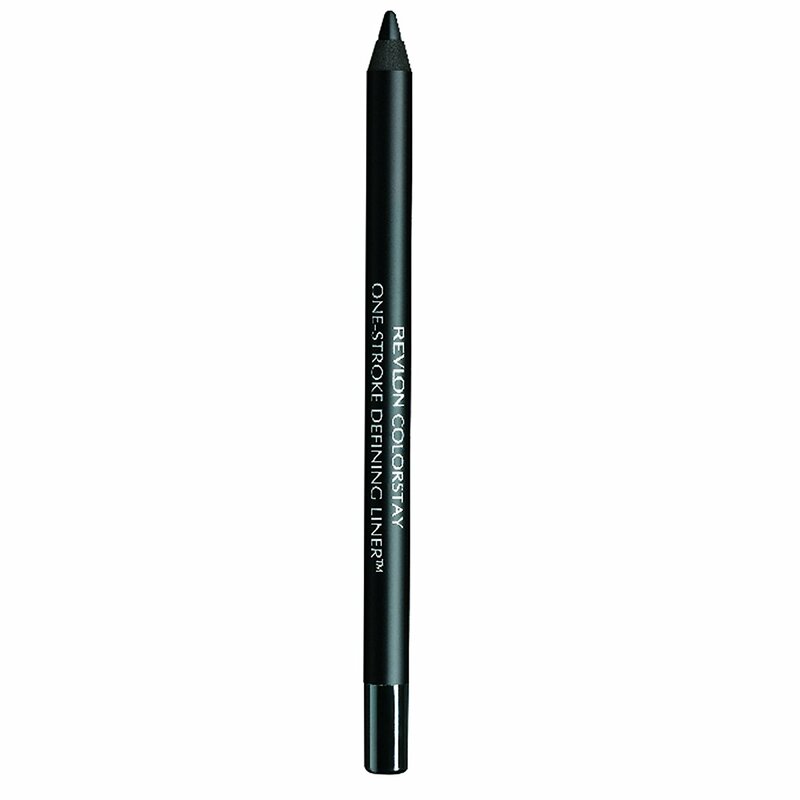 If there are any gaps, use the liquid liner pen to fill in very gently. Remember the thumb rule here- thin from inside and as you head to the outer corner, it gets thicker. You are ready to party like a diva now! 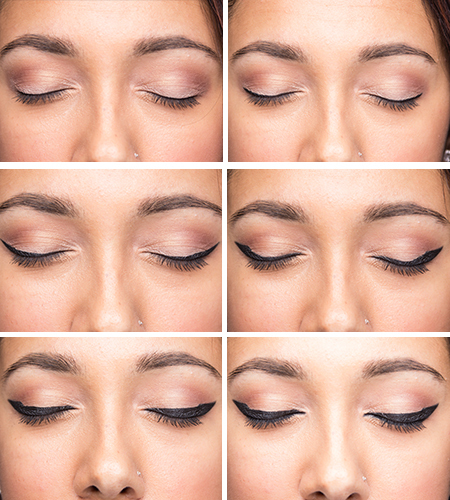 Practice away the tips on how to apply liquid eyeliner and rule the eye makeup scene out there!